The project is a town wide community photo-collage of the history of the Town of Wallingford. The goal was to involve the community in creating this collage to not only get them interested in art but also have them explore their creative side. To bring the community together for this project the lead artist, Rashmi, enlisted the Wallingford Public Library as its co-sponsor. The Wallingford Public Library has a long history of involving the community in a variety of projects by reaching out to its members, who form the bulk of the town population, to promote social issues. Based on the lead artist’s own series of photo collages, creation of the collage took place in the library and was open to all age groups of the entire population of the town. Town residents were involved from the beginning of the creative process of taking photographs of the town, bringing in their old photographs and finally creating the collage over a twelve-week period under the supervision of the lead artist. The eventual selection of photographs to be used in the collage was a collaborative effort between library and the lead artist, who also extensively photographed various town wide locations to present a cross section of the residential, commercial and rural neighborhoods as a complete portrait of their hometown. Historic photographs from the town archives were also used in to bring about additional awareness of the town to the public. The collage comprised of images cut out of assorted photo prints to create a town scape keeping in mind perspective, proportion, color composition and light and shade. 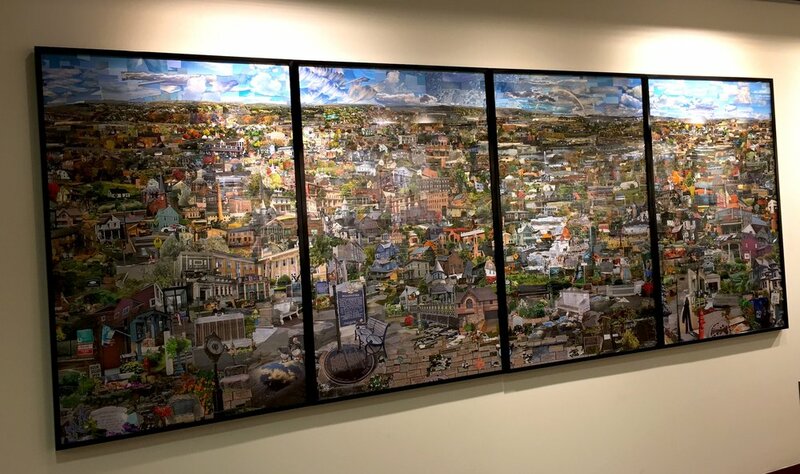 The end result was a large format collage, sized 4 feet X 10.4 feet, composed of fragments of photographic prints to look like a single photographic image of an imaginary but familiar landscape, and displayed in the Wallingford Public Library.